In life, there are few things that are so desired by many, and fewer still that require so much grit and resilience. Take for example, the elusive concert ticket from that one inter-continental band, and the corresponding hours of underpaid labor to save for that price tag. Or that perfect score and its required weeks of slogging through the books. For us Ultimate players, that desire manifests in our hours upon hours of training, bearing the torrential rain, and holding our breath for fear of a cancelled training when the sky flashes in anger. Scraping out the hardened dirt from beneath our cleats. Washing our beloved white jersey, now turned a dirty brown from zealous attempts at a stray disc. Throwing. Throwing. And more throwing. All for that desire for a perfect throw, that feeling of awe at the trajectory of the disc. For that perfect layout, an inhumane flight to grasp the disc with the tips of the fingers. All for that eruption of cheers from the sidelines, for the din to drown you in exhilaration, for that immemorial moment of victory, triumph, and camaraderie. Skeptics often shake their heads in disbelief, at this glorified game of captain’s ball (or disc, rather). But this unorthodox sport that combines the mechanics of basketball, soccer, American Football, etc., has actually captured the hearts of many and have gathered a sizeable following around the world. 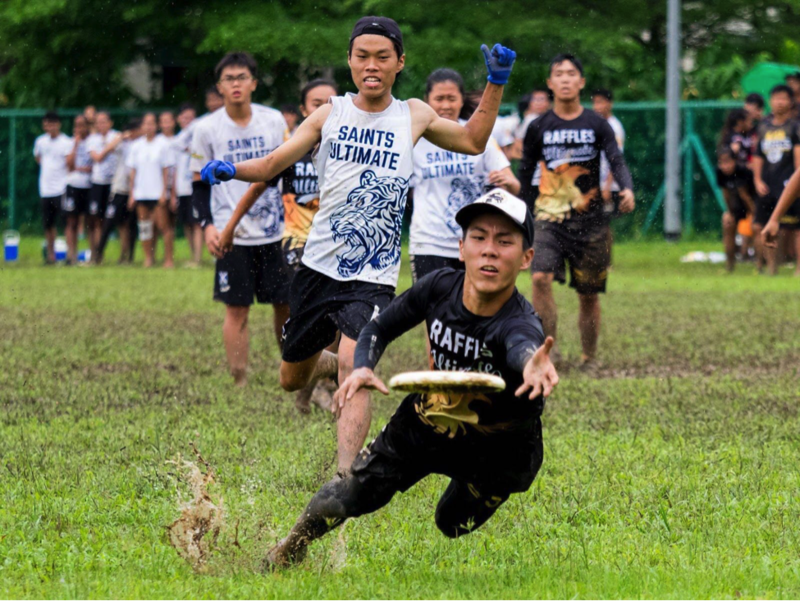 In fact, Ultimate players have infiltrated the Singaporean landscape, with places like Bishan Park, Hong Lim Park, and Ang Mo Kio Djitsun Mall becoming mainstays of the community. Even in RI, the reach of Ultimate has moved beyond PE lesson settings, to the Raffles Green, where the younger Rafflesians practice, and of course the Amphitheatre, a haunt of many batches of Ultimate players. Raffles Ultimate strives to become that very superstar team. Excellence is the foundation of our goals. Year after year, we challenge ourselves, physically and mentally, for the championship title at the annual Inter-JCs. This can only be achieved with a united team, pushing each other through grueling trainings on the field, and hitting the gym together off the field. Whether it’s chilling at the Amphi tables, intermittently running to get a spot in an impromptu scrimmage, or sharing recovery food at the end of a hard day’s training, a deep sense of camaraderie runs through each and every player’s veins. This thread of unity extends well beyond the individual batches, and the love of the game even brings back alumni many years senior to the current batches of players. 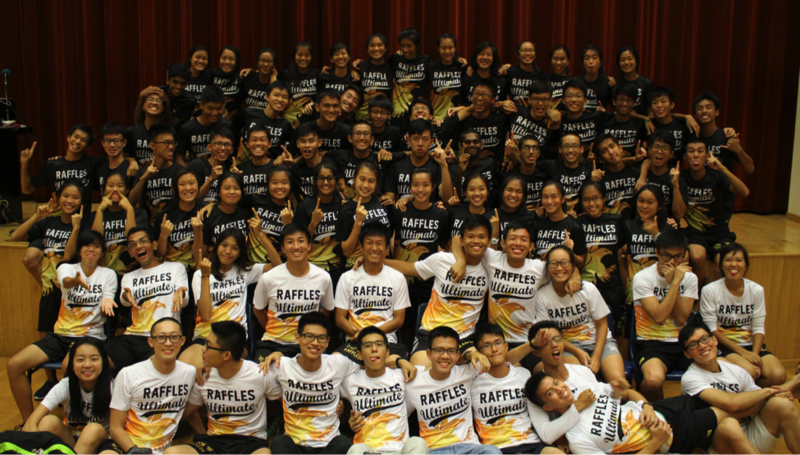 Committed to bringing Raffles Ultimate to greater heights, these NSmen and undergraduates paint the picture of a unique and undying passion for the Raffles Ultimate tradition. It is certainly heartwarming to find mentors and friends in alumni much older than ourselves, brought together by a shared love of Ultimate. This truly is testament to the saying that Ultimate is not merely a sport, but a culture, a lifestyle. If you are ready for all these, with clear eyes and full hearts, we dare you to join us on a journey to be an Ultimate player. Simply bring your best self to trials – nothing more, nothing less.